In situ Hybridization (ISH) is a method that allows to localize and detect nucleic acid sequences within structurally intact cells or morphologically preserved tissues sections. Fluorescence in situ hybridization (FISH) is a kind of ISH which uses fluorescent probes binding parts of the chromosome to show a high degree of sequence complementarity. The basic principles for FISH and all other methods of in situ hybridization are the same, except one is utilizing a fluorescence probe to detect specific nucleotide sequences within cells and tissues. They differ from immunohistochemistry which usually localize proteins in tissue sections. In situ hybridization can be performed on a variety of targets, including RNA within cells, DNA in metaphase chromosome preparations obtained from mitotic cells, or DNA in interphase nuclei from cells in the non-mitotic phases of the cell cycle. In addition to the advantages of detection in morphologic context, in situ hybridization has become popular also because of its high sensitivity in nucleic acid detection. In situ hybridization has been widely used for research applications, including clinical cytogenetics, gene mapping, tumor biology and studies of chromosome evolution. Probe is critical to in situ hybridization, and a right probe can help you achieve your goals. Not only the probe types but also the label of probe should you take into account when you choose a probe for in situ hybridization. There are essentially four types of probe that can be used in performing in situ hybridization. The information of the probe types is listed in Table1. To "see" where the probe has bound within your cells or tissue section you must attach a label to the probe before hybridization. The presence of the label should not interfere with the hybridization reaction. There are a variety of labeling techniques which can be divided into two types: radioactive isotopes and non-radioactive labels. Radiolabeled probes, including 3H, 35S, 32P, are still widely used due to its high activity which can be detected transcripts in low amounts. When using the radiolabeling, waste disposal and containment measures must be take into account and it must be noted that the useful shelf life of your labeled probe is inherently dependent on the half-life of the radionucleotide. On the other hand, non-radioactive successfully used with in situ hybridization include digoxigenin (DIG), biotin and fluorescent labels. The non-radioactive labeled probe can be either used immediately or be stored at -20 °C as these non-radioactive labels have no inherent "decay" kinetics. For chromosome spreads, alcohol/ether (1:1) cleaned slides are sufficient. However, since tissue sections may be lost during the procedure, either polylysine or glutaraldehyde-activated gelatin chrome aluminum slides for these sections are required. To preserve morphology, fresh tissue should be rapidly removed and fixed as soon as possible. From a chemical point of view, common precipitating fixatives (such as acetic acid/ethanol and Carnoy's fixative) are not recommended because of a fear that such fixatives would make the cell matrix impermeable, or alter the target nucleic acid to a point that hybridization would be reduced or prevented. For metaphase chromosome spreads, methanol/acetic acid fixation is usually sufficient. For paraffin-embedded tissue sections, formalin fixation is always used. Cryostat sections fixed for 30 min with 4% formaldehyde or with Bouin’s fixative have been used successfully, as well as paraformaldehyde vapor fixation. There is still no fixation protocol which can be used for all substrates, and the fixation protocols must be optimized for different applications. After fixation, the sample is embedded in paraffin or OCT for long-term storage and sectioning for subsequent procedure. The embedded tissues can be sectioned to thin slices with microtome or freezing microtome (15-20μm). It is known that the target DNA or RNA sequences are surrounded by proteins and the extensive cross-linking of these proteins mask the target nucleic acid, which present obstacles to good infiltration of the probe. Therefore, permeabilization procedures are critical to in situ hybridization. Three main reagents used to permeabilize tissue are proteinase, HCl and detergents. Protease treatment serves to increase target accessibility by digesting the proteins that surround the target nucleic acid. Proteinase K or pronase is usually used to remove those proteins. Optimal concentration has to be determined but a normal starting concentration is 1 µg/ml. Incubation has to be carefully monitored because if the digestion proceeds to far you could end up destroying most of the tissue or cell integrity. In some protocols a 20-30 min treatment with 0.2M HCl is recommended. Although the precise action of the acid is unknown, the extraction of proteins and hydrolysis of the target sequence may contribute to a decrease of the level of background staining. The Triton X-100, SDS and other detergents, are frequently used to permeabilize the membranes by extracting the lipids membrane. This is not usually required in tissue that has been embedded in wax, but it is critical to intact cells or cryostat sections. Pretreatment/ prehybridization is generally carried out to low the background noise. When an enzyme (such as peroxidases or alkaline phosphatases) is used visualize the label, the endogenous enzymes which could result in high background have to be inactivated. This can be achieved with peroxidase by treating the sample with 1% H2O2 methanol for 30 min. As for alkaline phosphatase, the levamisole can be added to the substrate solution, however this may be unnecessary since the residual alkaline phosphatase activity is usually lost during hybridization. RNase treatment serves to remove endogenous RNA and decrease background in hybridization reaction. It is performed by incubating the preparations in DNase-free RNase (100 µg/ml) in 2xSSC (SSC = 150 mM NaCl, 15 mM sodium citrate, pH 7.4) at 37°C for 60 min. Prehybridization is carried out by incubating the tissue or section within a solution that contains all the components of the hybridization mixture, minus the probe. Not all protocols need this step. Unbound or loosely bound probes are removed by performing washes. Solution parameters such as temperature, salt and detergent concentration can be manipulated to remove non-specific interactions. Direct methods: The detectable reporter is bound to the probe directly so that the probe-target hybrids can be detected under a microscope immediately post-hybridization washes. Indirect methods: If antibodies against the reporter molecules are available, indirect procedures are recommended. Indirect methods require the probe to contain a reporter molecule, introduced enzymatically or chemically, which can be detected by affinity cytochemistry. Probes labelled with biotin, DIG or FITC are usually detected by specific antibodies. Learn more about in situ hybridization (ISH) and fluorescence in situ hybridization (FISH) service. 1. Brammer, S. P.; et al. 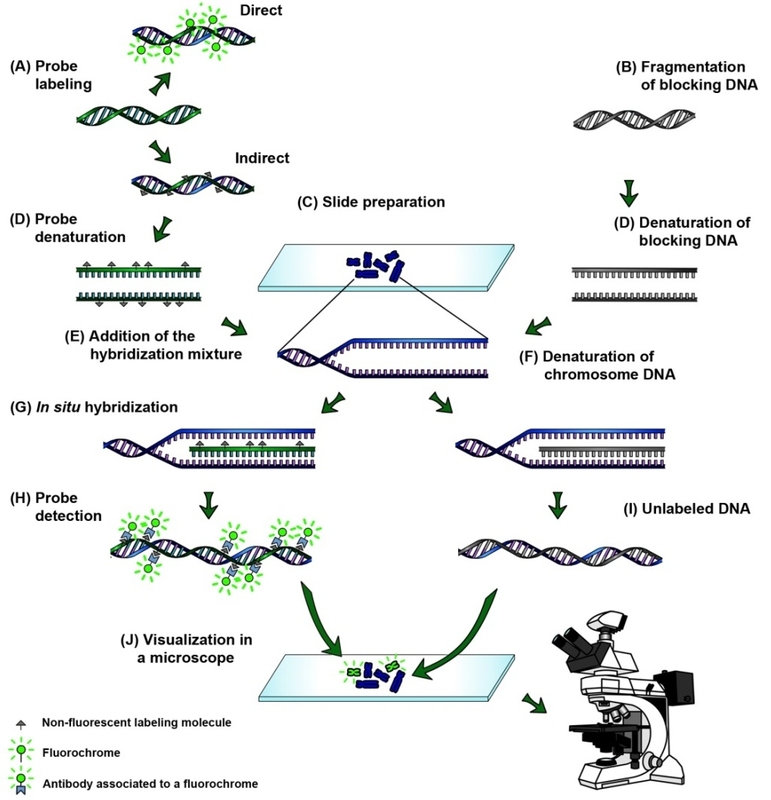 Genomic in situ hybridization in Triticeae: a methodological approach[M]. Plant Breeding from Laboratories to Fields. In Tech, 2013.